The Estuary Carol Walk is a unique opportunity to enjoy our beloved Airpark and Riverway during the winter season. Carolers will share universal spiritual and secular musical traditions with birds, seals, salmon and other residents of our community. “It’s not necessary to be a choir singer – like the other Estuary inhabitants, we’ll just raise our voices,” says Joanna Finch, carol leader. This Dec. 3rd Project Watershed-sponsored event is not a fundraiser, rather it is an invitation to include nature as part of your festive activities. The seventh annual Comox Valley Estuary Carol walk begins at dusk (4:00 pm), Sunday, Dec. 3 at Mansfield Drive parking lot (behind the Bayside Cafe at 26th off Cliffe Ave). 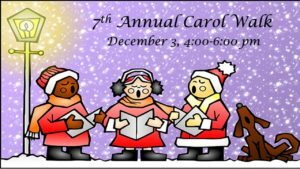 Carolers may also join at the Airpark marina parking lot or on the covered patio at Locals Restaurant, near the Old House. Children and dogs welcome! We live in a Canadian rainforest so dress for the weather. Carry a water bottle. Bring a flashlight or headlamp if possible. Park vehicles at Mansfield Drive, the Airpark or near the Old House. Locals Chef Ronald and Host Trish St Pierre will offer a complementary wassail cup to all wandering minstrels arriving about 5:30 pm. Those staying for dinner should make a reservation prior to the event (250 338-6493) and may order off the regular menu or select the seasonal special. Joanna Finch has prepared an online carol booklet that may be downloaded. Joanna is a well-known singer/songwriter who directs VocalEase classes and workshops. Any attending choral groups, choirs and musicians are encouraged to add interesting harmonics. Sheila Borman is organizing the volunteer team, supported by St. John’s Ambulance volunteers. Christmas is a period of anticipation, a time when people light up long dark days and nights with candles, carols and festivities. The old-fashioned purpose of this event is to enjoy making joyful sounds in our special outdoor environment, while continuing the tradition of holiday sing-alongs. For more information, contact the Project Watershed office (250 703-2871).